Top quality heavy duty inflatable fenders, made in Holland. Manufactured from UV resistant white PVC with BLUE reinforced star pattern heads in the classic European style. These fenders are commercial quality at a very realistic price. A large range of sizes are available to suit small runabouts up to large yachts and cruisers. Available as fender only - or complete with silver rope lanyards spliced onto the eye of the fender, ready to use. RWB1546 1100 x 350mm 44" x 14"
RWB1547 1400 x 450mm 56" x 18"
RWB1548 1600 x 600mm 64" x 24"
- The unique material is manufactured in a tube shape and the special design of fabric means that it can be simply be cut to length to fit the fender. - The fibres have the highest colour and UV resistance possible for textiles. - The edges roll over neatly after cutting so there is no sewing required. The end result is a superior fender cover that is also less expensive than the competition. - Quality is superior to all other fender covers on the market at a lower cost per cover. - U.V. Resistant Fender covers will not fade for years! Fendress fender covers are high quality covers made in France to exacting standards. Manufactured from premium quality loop knit acrylic material which is non-abrasive and UV and salt water resistant. Protect your fender - and the boats gelcoat with these high quality fender covers. This range offender covers is made from single thickness material and are hang packed and priced In PAIRS. They have an elastic loop knitted into the fabric on one end to hold the cover tightly onto the fender. Tip - fit the cover before inflating the fender. sized specifecally to exactly flt our RWB/MAJONI fenders. -Elastic loop knitted into the fabric on one end for exact fit. A quality modular fender storage system featuring fusion welded stainless baskets and nylon / stainless rail clamps. The rail clamps suit 22mm (7/8"), 25mm (1") & 30mm (1 1/4") rails. These clamps allow the baskets to be mounted to vertical, horizontal or inclined rails to easily adapt to any mounting positions required. A stainless steel fender basket clamp is also available to hold baskets together rigidly if a bank of baskets is required. -Modular mounting system suits most rail sizes and angles. ​Top quality Australian made buoys, manufactured from high density UV stabilised polyethylene for long life and rugged service. Foam filling (where provided) is closed cell polyurethane foam which will allow the buoy to float even if the outer skin is damaged. 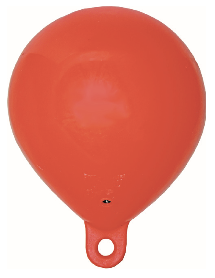 They are available in yellow colour for standard pleasure boat moorings or red colour on larger buoys, which signifies a commercial vessels mooring. Conical shaped buoy used for standard moorings. 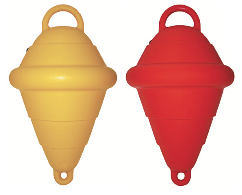 Heavy duty conical shaped buoy available in hollow or foam filled styles. right through the buoy -approx 35mm diameter. Yellow or red colour. Height: 610mm - 24"
Top quality UV resistant white PVC teardrop style in atable fenders / buoys with heavy duty blue reinforced eye. They have applications for use as fenders on pleasure or commercial vessels or as oat buoys. 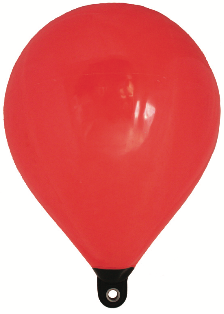 In are fenders with an air compressor or use a bike pump adaptor fitting - see below. White with blue reinforced eye end. Orange PVC heavy duty teardrop style in atable buoys with black reinforced head complete with stainless steel eye thimble for additional strength. 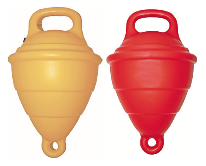 These buoys have applications for the commercial shing industry, general commercial marine and pleasure boats. 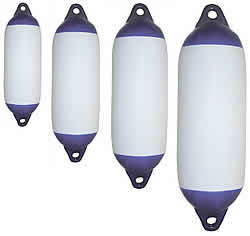 They can be used as oat buoys, net oats, marker buoys or as fenders on larger boats. In ate fenders with an air compressor or use a bike pump adaptor tting - see below. Bright orange with black reinforced eye end with solid stainless steel thimble. Bright orange inflatable oats made in Holland from UV resistant durable PVC. Complete with a solid moulded eye and a brass inflation valve.